Raymond (Ray) was a higher education access student. He completed a degree in Genetics and Cell Biology in Dublin City University (DCU) in 2013, graduating with honours. During his time in DCU he received a Diageo Ireland scholarship, a Paddy Wright memorial scholarship and a Washington Ireland Program scholarship. Ray had an interest in computing from a young age, completing several part time courses in computing from Dublin Institute of Technology (DIT) while attending school (prior to university). As an undergraduate, Ray obtained experience in a number of labs including: The Flemish Institute of Biotechnology in the University of Ghent where he developed a transcription factor binding site prediction tool based on a novel algorithm published in Nucleic Acids Research (see paper). Ray worked in the National Institute of Cellular Biotechnology (NICB) to for his final year undergraduate thesis, using the R environment to apply a novel network clustering method designed to locate novel prognostic markers for non-small-cell lung cancer. As a Washington Ireland Program scholar Ray gained an internship in the Lombardi Cancer Research Center in Georgetown University to study the mechanisms of resistance to Herceptin in treatment of breast cancers. 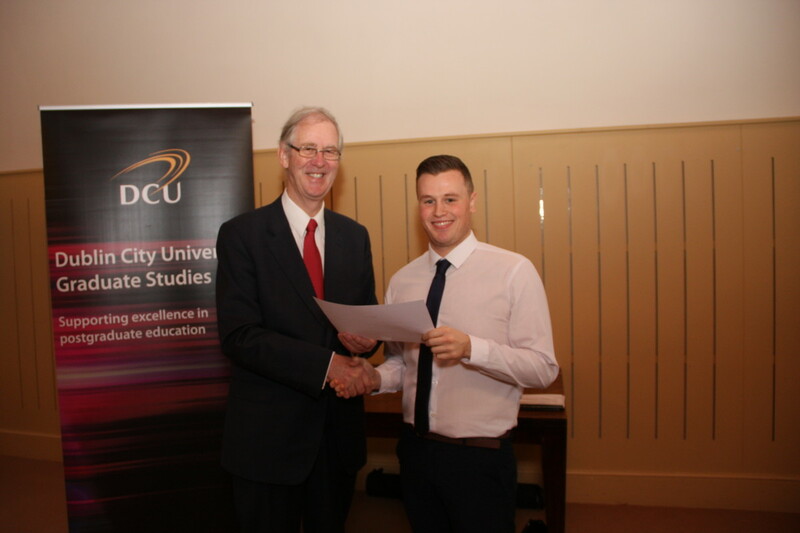 In October 2013 Ray was awarded the Daniel O’Hare Scholarship (pictured above at the award ceremony) to pursue his PhD in Dr. Mary J. O’Connell’s research team at DCU. In 2014 he was awarded a highly prestigious Irish Research Council Scholarship to fund his PhD to completion. Ray’s PhD was at the interface between traditional phylogenetic approaches and novel network mathematical applications to understand relationships between species and protein coding sequences. Ray successfully defended his PhD in August 2017 and graduated with his PhD in the November Conferring Ceremony at DCU. Ray is currently working in research and development with Genomic Medicine Ireland.